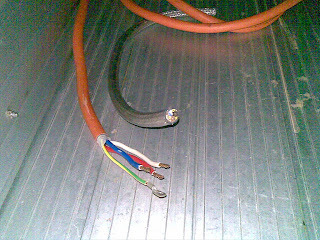 Malcolm Faed's Blog: Orange cable bad / Clear cable good. I swapped the motor cable in my ute last weekend on the advice of a few people with a lot of experience dealing with variable frequency drives. The ute has been running for a week trouble free so I am hoping that the new cable has solved the intermittent "Earth Fault" error that was happening. I originally wanted this kind of cable but was unable to locate any at the wholesalers. I found what I needed only after asking to look through their supplier catalogs. The cable is distributed by Bambach Wires & Cables. From TLE the part number is BAM45903CRS in case anyone is looking for some. The construction is 3 x 10mm^2 3 phase, with 3 earths ~2mm^2 and a foil and braided shield. Make sure the cable is terminated correctly at the motor using a metal gland that contacts the braid and as per the VFD manufacturer's instructions at the drive. As the fault was very intermittent, I will be satisfied this has solved the problem if I don't experience this problem for another 2 weeks. Here is a photo of the cable.